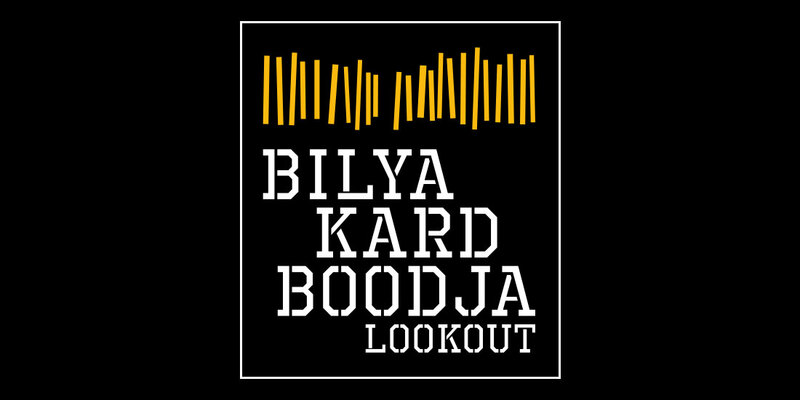 Bilya Kard Boodja Lookout is the new name for the well known Hardey Park high on the banks of the Swan River in the City of Belmont. 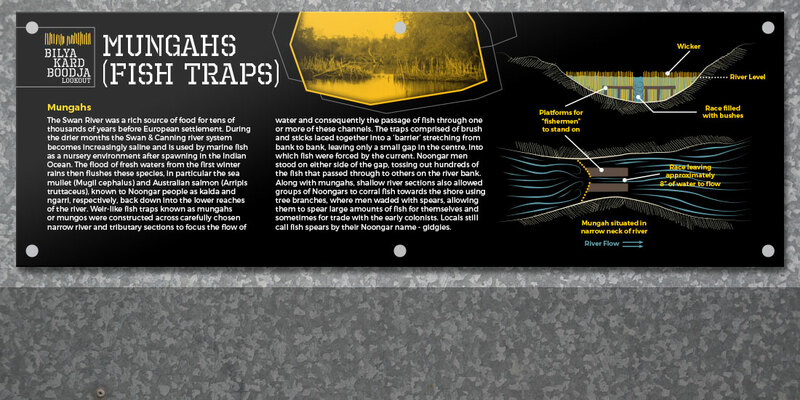 As part of the park redesign, Ecoscape was tasked with designing and implementing both interpretive signage and wayfinding signage elements. 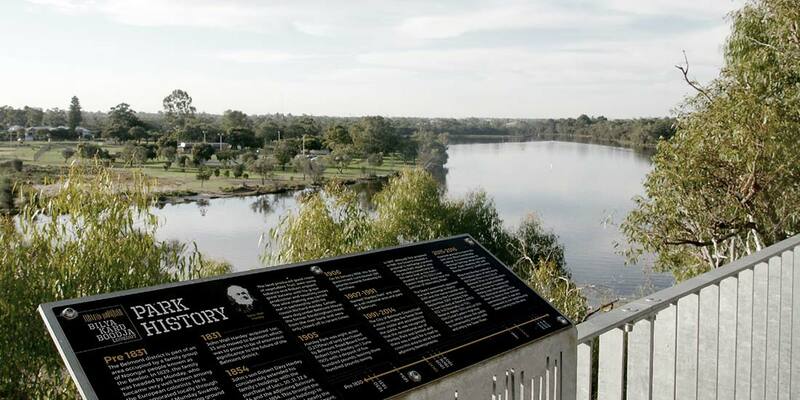 Bilya Kard Boodja Lookout (formerly Hardey Park) is the highest piece of land along the Swan River in the City of Belmont. The area has significant historical and cultural context and therefor the impetus behind the strategy to share this information with park visitors through interpretive signage. 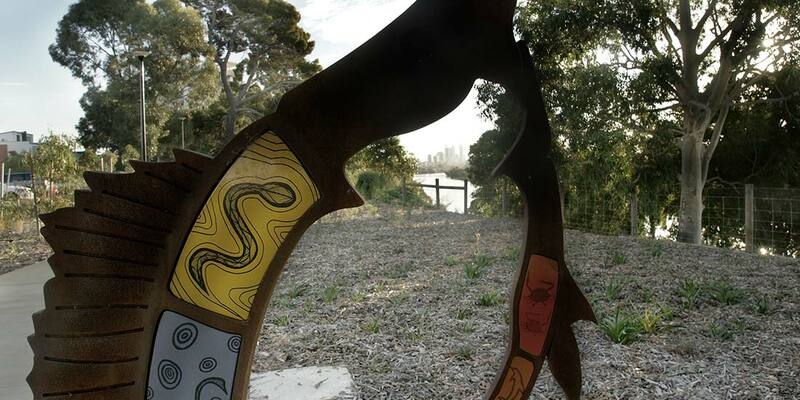 Prior to colonialization, this area provided a lookout over the River for hunting and fishing traps (Munguh) by the Aboriginal people and for them to observe their children swimming safely. It was also convenient to see neighbouring clans coming into the area. 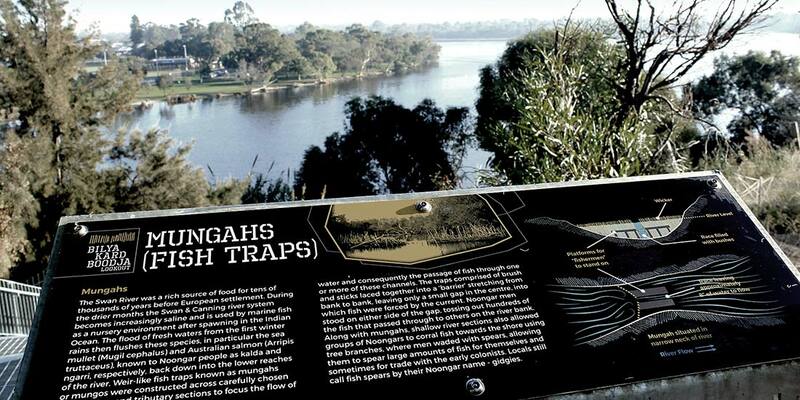 Ecoscape was tasked with creating interpretive signage educating visitors on both the history of the park and indigenous and cultural elements of the surrounding area including “bush tucker” and traditional fish traps called “Mungahs” that were historically used. Significant research and consultation went into the information for the signage to ensure accuracy and authenticity. 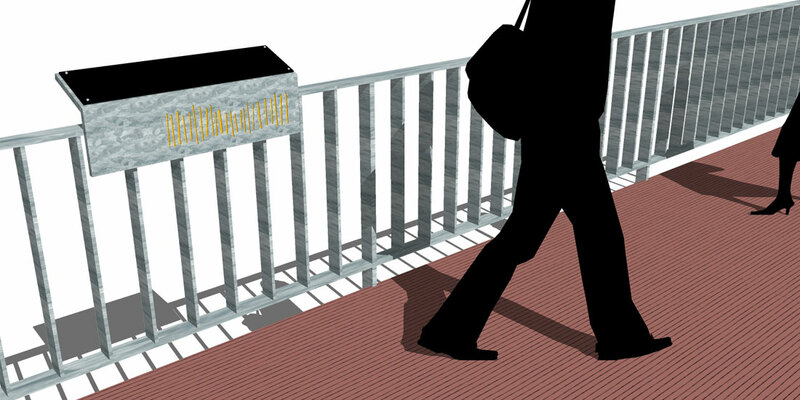 Small maps and wayfinding signage is also a part of the design strategy, particularly emphasizing accesibility in regards to the dramatic steps created as part of the overall plan. Ecoscape also was the design team for the landscape design of the revamped park itself. A place “brand” was created initially to dictate the design of the signs in regards to concept, colours, materials and graphic style. 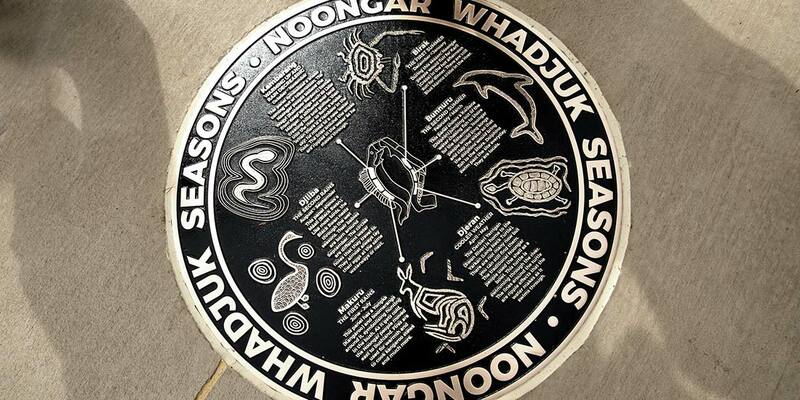 The brand design reflects the histroy of the park through the main graphic dervied from a representation of the traditional fish traps or “mungahs”. 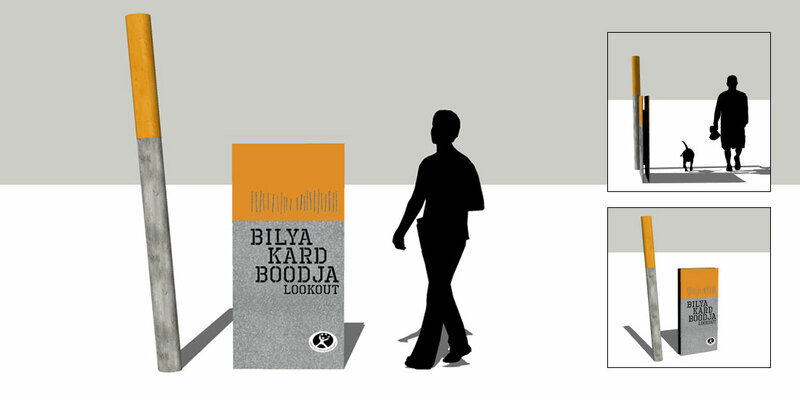 This brand is seen throughout the signage of the park and is introduced to visitors by monolithic entry signs strategically placed at the two main access points. The consistency of the branding emphasizes the idea of place and is instantly recognizeable making for a coherent signage application.